LIKE his short stories, renowned Urdu litterateur Naiyer Masud also has an elusive quality about him. 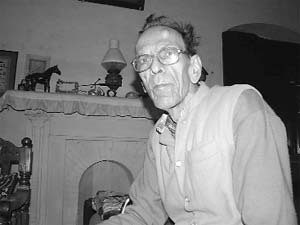 Speaking to him shortly after he was bestowed with the Saraswati Samman for the year 2007 for his short story collection Taus Chaman ki Maina (The Myna from Peacock Garden) evokes the same feel of no dramatic beginnings and endings that his stories are known for. Meeting him is just experiencing and being. Yet it leaves one soothed within as, like his fiction, one encounters order, neatness and decorum in his world. His 71 years weigh Masud heavily down as he reclines on a takht in the baithak of his sprawling ancestral house aptly named Adabistan (Abode of Culture) in Victoriaganj, which over the years has been shortened to Turiaganj, in the old part of the city Born in Lucknow on November 16, 1936, Masud has some two dozen books to his credit that include fiction, children’s books, translations and research work. A Ph.D in both Urdu and Persian he retired as a professor of Persian from Lucknow University. His fiction includes short story collections Simiya, Itre-e Kafur and Taus Chaman ki Maina. He has also translated Franz Kafka’s short stories and parables that appeared as a book called Kafka ke Afsane. He lives with his family in a majestic ancestral house built by his father. Married in 1971, the couple has three daughters and a son. A paralytic attack a few years ago and then a fracture of the hip has severely limited the writer’s physical movement. Not that he was a wanderer even before. Except for a brief three to four years outside the city, he has not only lived in Lucknow but in the same house— seeing time go by and chronicling it in a timeless sort of format. He talks about his life and work to Shahira Naim. You have recently been awarded the KK Birla Foundation’s prestigious Sarawasti Samman. How do you feel? Recognition and money is always a good omen. But what I deeply appreciate is the respect it brings to Urdu—the language I write in. That, I feel, is the true worth of this honour. I did not expect the award to be bestowed on an Urdu writer just six years after eminent Urdu critic Shamsur Rahman Faruqi received it. I had calculated that Urdu would have to wait for at least another 20 to 25 years before its turn came. Yes, that’s true. At least three of my stories, Nusrat, Occult Museum and Sheesha Ghat appeared in my dream. Do just the characters make an appearance, or is it the plot or the whole story? I view the whole story like a movie, not once but several times over. I do add a bit here or there. As a matter of fact, I’m always petrified that some one will accuse me of plagiarism as who knows if these stories materialise due to ideas lying in my subconscious mind after reading something that I may otherwise have forgotten. I remember writing Nusrat based on a person whom I knew as a child. Soon after I finished penning the story as it had appeared in a dream, I received a letter from a relative in Pakistan that the person who inspired the story had suddenly passed away just around the time the dream had first appeared, filling me with an eerie feeling. Tell us about your creative process. How do you write? Strangely, I cannot write outside this house. My creative juices just dry up outside this familiar environment that I am so attuned to. But otherwise I let the stories flow out. Never work too hard on the endings and beginnings— just retell a story as plainly as possible. But yes I do work hard on the verbal choice and shun exaggeration, embellishment and melodrama in both language and content. Incidentally the ones that have nothing special to say like Muraselah and Nosh Daru. As Shamsur Rahman Faruqi had commented "They don’t go anywhere". You have seen so much change around you from an almost constant perspective. What are the elements that you regret are being lost from your environment? Well, I’m not a nostalgic sort of person constantly harping about an era gone by. You would not see me lamenting the earthen surahi becoming extinct. Life is a dynamic process and change is the only constant. Still, is there something in your immediate environment that you would like to bring back? It is the social values of Lucknow on which its tehzeeb was dependent. These values are becoming increasingly irrelevant in this world. And this is something that pains me. Don’t you feel bothered that Urdu the language you nurtured so painstakingly has few readers today? That thought hurts. The situation is far worse in Uttar Pradesh than in say Bihar, West Bengal or even Maharashtra where the younger generation is not totally ignorant of Urdu. Here it is rare to find a young person fluent in the language. I see a very bleak future ahead for Urdu as I sense a deep political indifference for the language in UP.